First-graders are at such a fun age. They are curious, but can follow directions a bit better than their kindergarten counterparts. They are excited, they are joyful, and they can really start diving into musical literacy! In today’s article, I'm writing my tips for teaching first grade. If you haven't tried centers and are wondering what they might look like in the music room, check out my YouTube channel to watch videos with specific examples of centers for first grade. Even though they are only 6 or 7 years old, first-graders are ready for a challenge! Whether you have them keep the beat in their feet and the rhythm in their hands as they speak "Bee Bee," or have one half of the class read one rhythm with ta and ti-ti while the other half of the class reads another, they are so excited to show you what they are capable of! ...But don't forget that they are 6! Even though they are ready for more challenging tasks, they are still six or seven, so they love a lot of the same activities that they loved in kindergarten. Think about which activities your kindergartners absolutely love, and then think about how you might adapt those for first-graders. At this age, first-graders are more ready to work in small groups — to create, to make musical decisions, and more! This past November at the AOSA conference, I found the book "Rain,” by Kalan and Crews, at the West Music booth. I decided to use it with first grade, to assign a page to each small group, and then have them decide movement and/or instruments to accompany the reading of each page. Students were so creative with their choices, and had tons of fun performing! 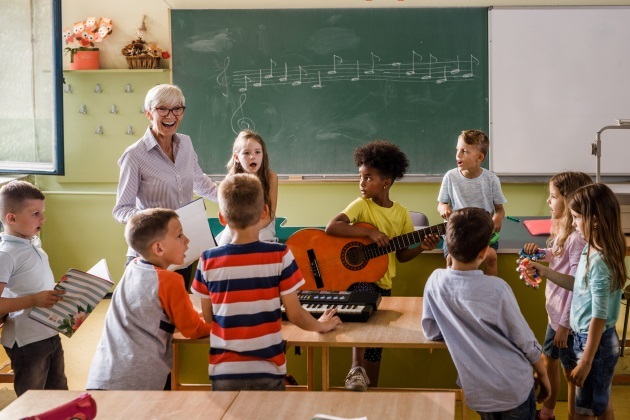 To practice different voices (such as speaking, singing, whisper, and calling), I’ve also had first-graders work in small groups to choose a song or chant from music class, then choose a voice they’d like to perform that song or chant. So, for example, one group might choose to perform “We are dancing” in a speaking voice, while another group might choose to perform “Engine Engine” in a whisper voice. Students get ownership with their decisions and they also get a chance to perform! Whether you are having students work in small groups, centers, or simply providing them with an interesting challenge, I hope you have fun with your first-graders! Aileen Miracle teaches general music in the Olentangy Local School District in Ohio; this is her 19th year teaching. Aileen received her BME from Central Michigan University and her MME from Capital University. In 2016, she was awarded Teacher of the Year at Cheshire Elementary. She is the co-chair for the 2019 OAKE conference, blogs at Mrs. Miracle's Music Room and presents music education workshops across the nation.